A new international report indicates that traffic congestion in the United States is far better than in Europe. The report was released by INRIX, an international provider of traffic information in 208 metropolitan areas in the United States and six European nations. The report shows that the added annual peak hour congestion delay in the United States is roughly one-third that of Europe. The rate of France was somewhat less than twice the rate of the US and rates in Luxembourg, the United Kingdom, Germany and the Netherlands were three times as high. In the United States, peak period traffic congestion adds 14.4 hours annually per driver. This compares to an average delay per year of 39.5 hours for the European nations. Luxembourg, the United Kingdom, the Netherlands and Germany had the greatest lost time, at from 42 to 47 hours. Again, France scored the best in Europe, at 24.1 hours of lost time in traffic per year (Figure). Among individual metropolitan areas. Los Angeles had the greatest peak hour delay, at 74.9 hours annually. 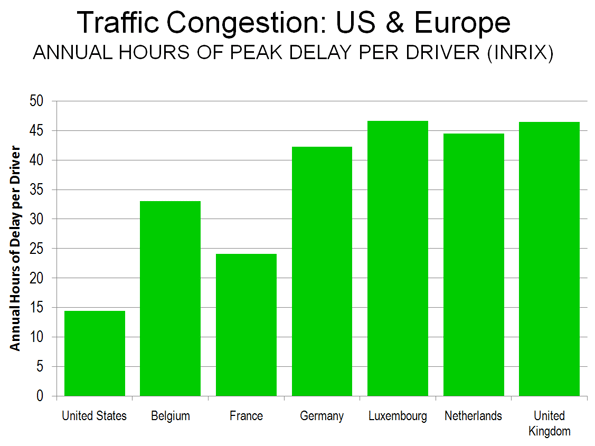 Utrecht (Netherlands), Manchester (United Kingdom), Paris, Arhem (Netherlands) and Trier (Germany) second through sixth in the intensity of traffic congestion, all with 65 or more hours of delay per driver per year. These findings are consistent with international data indicating that traffic congestion tends to be more intense where there are higher urban population densities. Submitted by bhartidivya56 on Mon, 05/18/2015 - 23:39. Submitted by raushany66 on Mon, 03/02/2015 - 04:19. Assured, the individuals that definitely will get your present items are getting to deal with everything- beginning in offering and also acquiring the items and offering all of them for the appropriate holiday. Submitted by meela cagney on Fri, 02/27/2015 - 23:16. Submitted by williama on Mon, 09/01/2014 - 04:44. Submitted by subbiaya on Thu, 07/17/2014 - 07:12. Submitted by reshhia on Fri, 08/30/2013 - 09:50. As well as knowing the bigger picture, you want to be able to dynamically adjust your project delivery. Creating real time evaluation feedback loops helps you to alliteratively www.customwritings.ws your work to respond to needs of the people you’re working with and the changing context you’re working in. Submitted by passionlab on Tue, 08/20/2013 - 07:33. Submitted by RaymondMAguero on Mon, 05/19/2014 - 19:43. Submitted by passionlab on Mon, 08/19/2013 - 14:48. Submitted by Jane Smith on Thu, 08/08/2013 - 07:42. The road sphere in the USA develops more than in Europe.